Earlier this week, Logitech created a stir with their inaugural campaign for the Revue, a Google TV-based set-top box solution designed to sit between your Cable Box/DVR and TV to deliver a series of Internet-hosted features. The campaign features your TV, with a creepy eye and a mans legs. The concept isn’t new and is directly reminiscent of TiVo, the adorable little TV mascot and former plush toy whose bootup ads my 3yo son wants to watch over and over again on YouTube. There are a lot of ways to get people talking about your new product in an edgy way, but this misses the mark. It features a set of masculine legs attached to an HDTV, a female eye or alternating male mouth on the screen. The first ad shows your TV taking a dip in your pool. Odd on top of oddity considering the warnings and horror movies growing up where the person is electrocuted by an CE device – TV, alarm clock, etc. being dropped in to the tub or pool. Then there’s the “Eye of Sauron” spectre of privacy concerns. What does Logitech know about me? Google on my TV? Logitech had to pull the 3rd installment in their online video ad campaign, a sequence involving a teenage girl being scared out of her wits by the TV eye with naked adult male legs appearing on her bed late at night, interrupting a video chat on her Logitech webcam. Who thought this was appropriate for a US market launch? TV Viewing is Up, not Down. The premise of your video is that your TV is lonely, and the family isn’t watching anymore. This is inaccurate. Nearly every study over the past 3 years shows that TV consumption is actually up, despite the rise of multitasking and social media. The latest is here, proving a multinational trend and published just this month. Women control the CE purchase decision in households. For the past five years, compounding evidence showing women influence 90% of consumer electronics purchases and make 57% of the purchases to the tune of $80B/year in the US alone. Your value prop is that your TV is lonely and going to go poltergeist on your household until you buy Revue? So it’s time to take a different tack. This isn’t the Droid that your marketing – this is a device considered an intrinsic part of the nuclear household – you got that part right. But consider the value proposition of your product – how does it elevate your brand message? How does it solve problems (instead of becoming a nuisance)? How does it bring the family back together? One has to suspect the creative lead Logitech’s agency pored over TiVo’s creative, and late at night hoping for inspiration tripped on acid before passing out while the original Toy Story movie was playing in the background – the one where evil Sid creates Mutant Toys like a crane with legs. Logitech we sincerely wish you success in redefining the category that WebTV failed to ignite over a decade ago, but “No such thing as bad publicity” aside, you have to consider this is a product that the whole family will need to adopt, and that decision resides with the Wife/Mom. 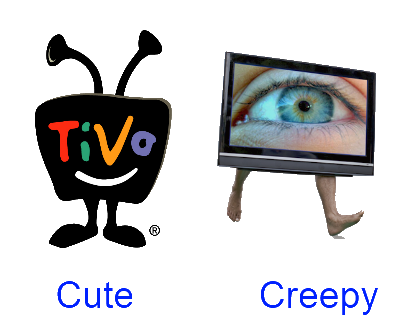 Also consider TiVo’s strengths and weaknesses – a poor facsimile of their mascot is the wrong place to start conversing with prospective customers.